Framus Guitars are active for 2010 pre-NAMM. 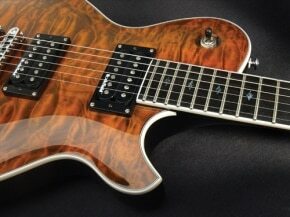 The successful guitar company introduces two revised guitars. First we have the Framus Diablo Series that has been completely revised for 2010. The body shaping has been ergonomically optimized, the pickup repertoire has been expanded, and die wood options now offer a broad range of body and neck combinations. The models Diablo Supreme and Diablo Supreme X are now the new flagships of the series. Both feature an elegant arched book-matched AAA flamed maple top and a rosewood fingerboard, but retain otherwise a completely independent character that makes them shine each on its own. While the Framus Diablo Supreme conveys a classic appeal in terms of sound, sustain and feeling with its mahogany body and maple top, set mahogany neck, double humbucker outfitting and TonePros Wrap-around bridge, the Framus Diablo Supreme X is a versatility marvel with its swamp ash body and maple top, bolt-in flamed maple neck, Framus by Wilkinson vibrato and 3 pickup configuration. Visit http://www.framus.de for more information.